It’s been a while, but for hopefully good reasons! Here I’ll start back up with a mouthful: Chocolate Toffee Caramel Cake. Caramel notes are full force in a moist and tender cake and smooth caramel buttercream. 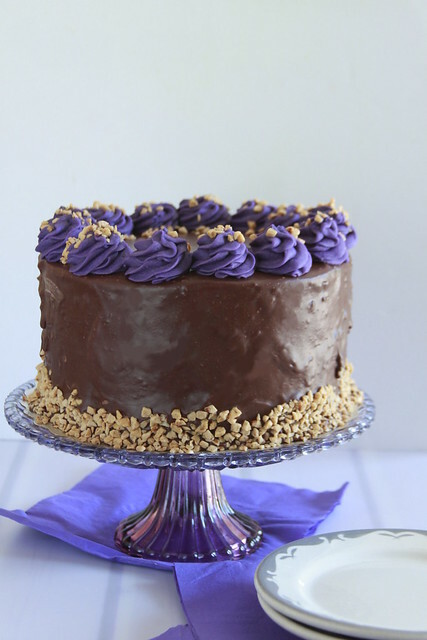 Crunchy toffee filling and a chocolate pour give this cake a balance in texture and milk chocolate flavor! In the beginning of this year, I had gone abroad for the first time, experiencing the wonders of Italy. Yet despite the slue of gorgeous Italian desserts, I was more happy about an easy access to the wonders of Milka chocolate bars. Not Italian, yes, but deliriously dangerous. Despite the long bars weighing 300 grams, I was hypnotically drawn into on flavor combination: milk chocolate, toffee, caramel, and hazelnuts. State side, that limited edition flavor is impossible to come by. 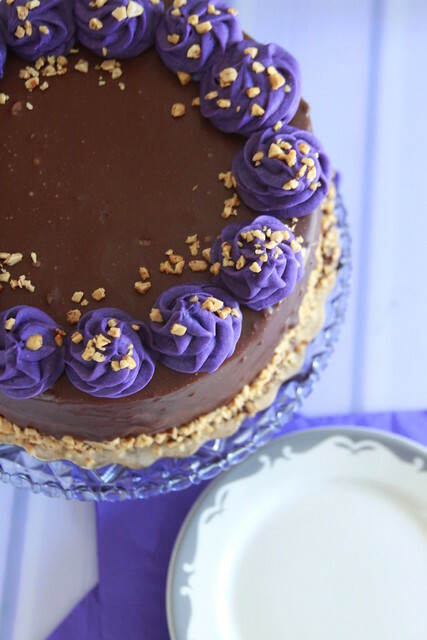 My best solution was to make a cake in tribute to the Milka’s chocolate bar. It’s easy to turn to chocolate cake for this matter. In fact, a lot of my candy-bar inspired cakes, like the Milky Way Cake or the Chocolate Peanut Butter Cake, have a chocolate cake base. Yet this chocolate required subtly. Chocolate was only on the surface. Here, the center stage attraction was the crunchy, creamy, caramel-y, and nutty ingredients within. A caramel cake seemed easy enough, right? Boy was I wrong! Most brown sugar cakes circulating through the web or in books are dense and leaden, almost mirroring a pound cake’s texture. For this Chocolate Toffee Caramel Cake I wanted the dextrinized notes of brown sugar, without a hockey puck heaviness. Swapping out half of the sugar with granulated sugar, lightened the batter, as did the use of water in the wet ingredients. The recipe for the frosting for the Chocolate Toffee Caramel Cake can be found in my recipe index for frostings. When it comes to caramel frosting, its smoothness is unrivaled. 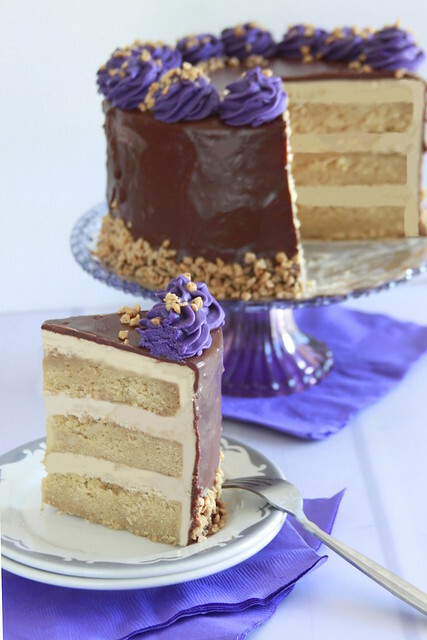 In-between the cake layers, the caramel frosting is mixed with toffee bits, recreating that Milka bar’s toffee crunch. If you are flush with money you can had chopped up toasted hazelnuts into the filling, but it’s not missed. 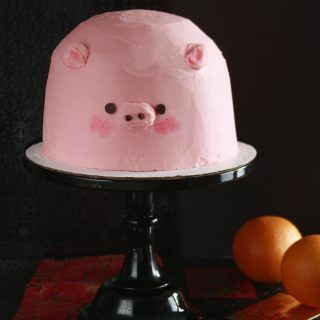 Since the cake is extremely tender, chilling/refrigerating is absolutely necessary to avoiding a crumbing cake mess. Enjoy a milky chocolate cake with caramel in this Chocolate Toffee Caramel Cake! Preheat oven to 350 degrees F. Grease three 8-inch cake pans with baking spray, set aside. In a stand fitted paddle attachment and cream butter, and sugars together, about 3 minutes on medium-high speed. Gradually add eggs, one at time, until completely combined. Scrape bowl and paddle as needed. In another bowl whisk vanilla, water, and sour cream. With the mixer on low add the dry-mixture 3 additions alternating with the wet-mixture in 2 additions, beginning and ending with the dry-mixture. Divide between pans, smoothing out top and tap against the counter to release any pockets of air. Bake for 25 to 30 minutes, rotating halfway. A toothpick inserted should come out mostly clean with a few moist, not wet, crumbs. 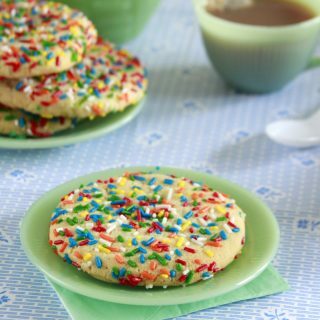 Let cakes rest in pans for two minutes before inverting onto a wire rack to cool completely. Use a serrated knife to level off cake layers. 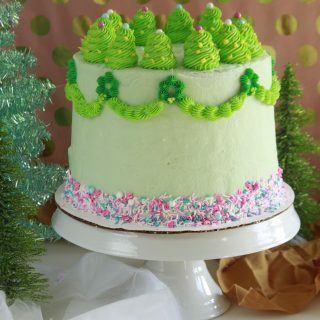 Apply a bit of frosting to a cake board and secure the first cake layer. Fold ½ cup toffee bits in 1 cup of Caramel Buttercream. Pipe a boarder of plain Caramel Frosting around the perimeter of the of the cake. Fill in with Toffee Caramel Frosting. Repeat with second layer, topping off with third layer. Freeze for 30 minutes. Apply crumb coat of Caramel Frosting and freeze for 15 minutes. 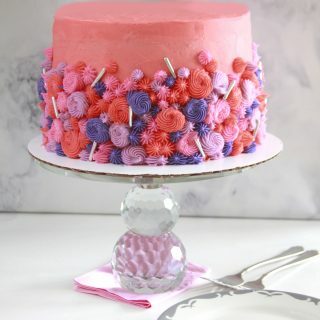 Apply a second, thicker, frosting layer, using a bench scraper to smooth the layer. Freeze for a final 10 minutes. Line a surface with parchment paper and place chilled cake onto a bowl, this will allow the chocolate topping to evenly coat the cake. Pour chocolate glaze over cake. Scrape sides, refrigerate for 1 hour, pipe boarders with remaining caramel frosting (I tinted mine purple) and garnish with remaining toffee and hazelnut bits. In a microwave safe bowl, melt chocolate, oil, and heavy cream in 20-second intervals, stirring each time, until melted and smooth. Once melted immediately pour over chilled cake, let drip, using an offset spatula to clean off the edges.